Home Article News Quality Software Testing Terminologies Tutorial Usability Beta Testing Crashed Mozilla Firefox 3 Beta 1! Beta Testing Crashed Mozilla Firefox 3 Beta 1! After an arduous Alpha development period that included no fewer than nine milestone releases, Mozilla has finally announced Firefox 3 Beta on November 19th, 2007. Mike Betlzner has a comprehensive post on DevNews, which reminds that the Firefox 3 Beta 1 milestone release is intended for testing purposes only and is not for casual users! According to Mozilla developers, the Firefox 3 Beta 1 milestone fixes over 11,000 bugs and has almost 2 million lines of code changes in comparison with the current Firefox 2.x browser. » Improved security features such as: better presentation of website identity and security, malware protection, stricter SSL error pages, anti-virus integration in the download manager, and version checking for insecure plugins. » Improved ease of use through: better password management, easier add-on installation, new download manager with resumable downloading, full page zoom, animated tab strip, and better integration with Windows Vista and Mac OS X. » Richer personalization through: one-click bookmarking, smart search bookmark folders, direct typing in location bar searches your history and bookmarks for URLs and page titles, ability to register web applications as protocol handlers, and better customization of download actions for file types. » Improved platform features such as: new graphics and font rendering architecture, major changes to the HTML rendering engine to provide better CSS, float-, and table layout support, native web page form controls, color profile management, and offline application support. » Performance improvements such as: better data reliability for user profiles, architectural improvements to speed up page rendering, over 300 memory leak fixes, and a new XPCOM cycle collector to reduce entire classes of leaks. I love to participate in Testing Beta Products such as this. To make sure I don’t miss an opportunity to get involved in testing a Beta Release, I have set a Google Alert to get updates about Beta Releases whenever there is one. This time also I was updated (thanks to Google Alert) as soon as there was a release of Firefox 3 Beta 1 milestone. I have downloaded and upgraded my Firefox 2 to this Beta Release and have been testing it since then. Here I must admit that this release seems to be lot faster (in terms of speed of performance) than its predecessor; thanks to the evidently improved architectural design. On the usability front, Beta 1 enables users to resume a download after the browser is restarted. The tab functionality in this release is improved with a new tab-scrolling feature and the ability to save tabs when closing the browser. My experience with the Beta 1 browser had been pretty good until today! Today, I was surfing through the blogosphere and suddenly all my open instances of Mozilla Firefox 3.0b1 were closed and I was displayed with the Mozilla Crash Reporter with the typical Crash!Bang!Boom! screen (click for a screenshot of the crash message)! I have submitted the crash to Mozilla with my email id to intimate me when the problem is fixed. Here are the details of the crash report! Pros – The crash report passes on functional (in telling the user that an unexpected problem has occurred and the Brower needs to shut down) grounds. The usability of the report is also quite acceptable. It is fairly capable of reporting the crash and goes ahead to tell that the Browser would try to restore the tabs and windows when it restarts. It allows the reporter to view the report before sending, gives a choice to report it to the developers at Mozilla and also to attach an email id to be reported back once the problem is sorted out. These are few qualities of a good error report, in my opinion. Cons – On the negative side, the error report does not include much technical details in the crash report. Although it contains some details to identify the crash, it does not show any crash dump or any such data that could have given some clue about the possible cause of the crash! It just contains some basic details like the BuildID, CrashTime, InstallTime, ProductName, SecondsSinceLastCrash, URL, UserID, Vendor and Version. But it leaves the tester without much information about the crash as such. Something like a time stamped list of actions or a stack dump could have been much more useful in giving the tester more info regarding the crash. Recoverability of the Application after the crash: I had chosen the “Restart Firefox” button on the crash report and it indeed was able to restore my previous tabs and windows with the last opened URLs. This is a good thing to see the Browser being able to recover on its own after the crash. Reproducibility: In this case, however, reproducing the crash was not as difficult as it seemed at the first glance! 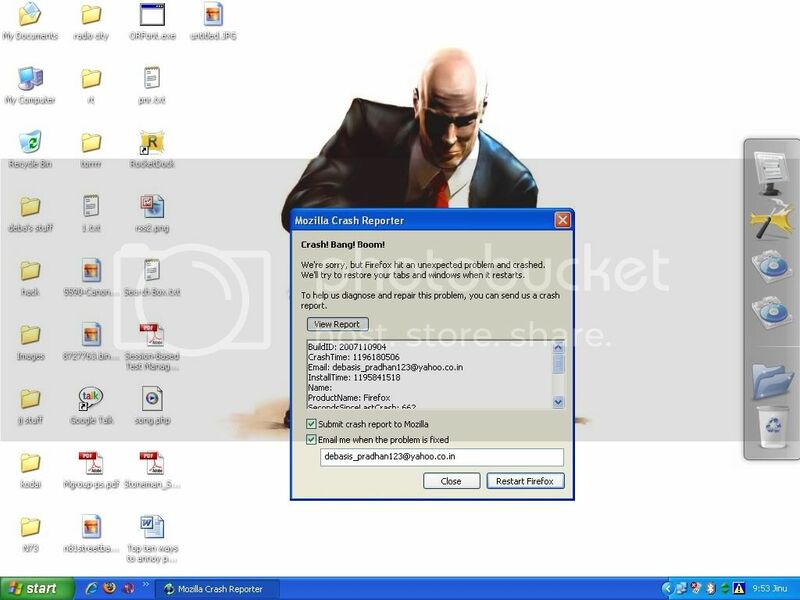 Looking into the crash report gave me the URL where I had got Mozilla Firefox 3 Beta 1 to crash. I tried opening the same URL once again and bang; it crashed again with the same error message [notice the “SecondsSinceLastCrash: 662” in the crash report]. However, this crash is not always reproducible. I was able to get this crash 6 out of 10 times while retesting. I have reported the crash at the Bugzilla at Mozilla too and waiting their response. I will keep you updated once I get any further communication from the Mozilla Developer team. In the mean while, feel free to retest this in your own system and let me know (by commenting) if you are able to reproduce the above crash!